The Dividend Discount Model’s four essential steps are summarized below. The purpose is to provide a quick reference for this valuation, give an example, and offer a spreadsheet template to facilitate calculations and sensitivity analysis. We’ve covered how to value a business with a Constant Dividend Growth Rate and, with a Multi-Stage Dividend Growth Rate. With this fundamental understanding in place, we can now boil it down to the Dividend Discount Model’s four essential steps. It assumes the company will continue a dividend into the future. Now, let’s go through the essential steps for calculating intrinsic value using the valuation on Brookfield Infrastructure as an example. We manually calculated the present value to gain a fundamental understanding of how the formula works. Here we incorporate the formulas into an Excel spreadsheet to speed up the calculations and reduce potential for errors. It is recommended that you take the time to set up a spread sheet to automate calculations for this method. Columns G, H and I show the formulas used in Columns C, D and E for this example. We start with an estimate of the per share dividend growth for each year. In the Example Table Column C, we assume 7% growth for 10 years. Starting with a $1.74/share dividend in Year 1, Column D shows the growth over time. Then, we discount each future year’s dividend back to the valuation date (Year 0). We use the 10% opportunity cost as the discount rate in this example. Column E in the Example Table shows the results. 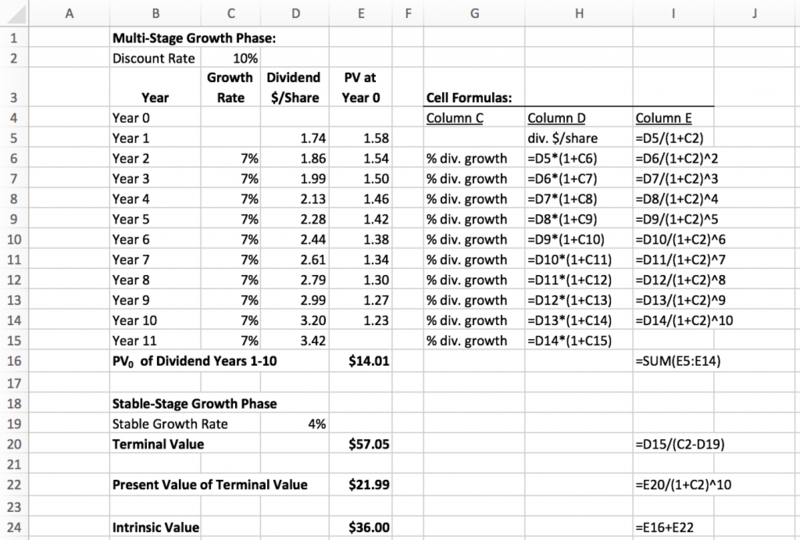 After that, we add them together to determine the total of the discounted dividends during the multi-stage growth phase shown in Cell E16. Example Spreadsheet, Click on it to enlarge. The stable growth rate in this example starts in Year 11 and beyond. 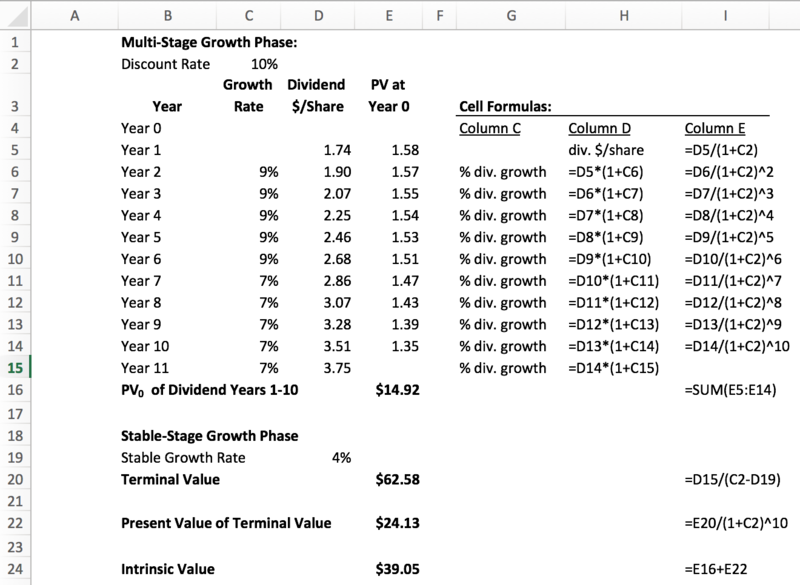 We use The Constant Growth Rate Model to calculate the value for this stage of growth, also called the “Terminal Value.” The Terminal Value is the value of dividends from Year 11 ($3.42) and beyond. We are assuming a stable growth rate of 4% (g = 4%) and a discount rate of 10% (r = 10%) in the example below. Terminal Value, Click on it to enlarge. Intrinsic Value, Click on it to enlarge. Since the stock price was $35 when we did this analysis and the intrinsic value is $36, the company is expected to return slightly over our required 10% per year. This is the same result as in the Brookfield Infrastructure post and illustrative of the essential steps for determining intrinsic value using the Dividend Discount Model. From a practical standpoint using an Excel spreadsheet will save you a lot of time and help reduce errors. The use of Excel facilitates doing sensitivity analysis or alternative cases, where we can examine the impact of different assumptions on the outcome. Although sensitivity analysis is not a required step to value an investment, it is important and, I rarely do a valuation without some. The sensitivity cases help us better understand the probable range of outcomes. Let’s look at a sensitivity example. Brookfield Infrastructure has been exceeding their dividend growth range target of 5 – 9%. The most recent increase, for example, was 11%. If we think this strong growth may continue based on knowledge of the company, then perhaps our 7% growth above is too conservative. Recent strong performance and near term significant growth, may indicate to some investors the high end of the dividend growth range may be a better assumption to use, at least for a while. The case below shows, how changing the dividend growth rate assumption from 7% to 9% for the next five years impacts the intrinsic value. DDM Sensitivity Example, Click on it to enlarge. With a spreadsheet, we can readily change the growth rate to 9% for 5 years, to determine the intrinsic value of $39 per share. With a stock price of $35 at the time of this analysis, as expected the company’s return is more attractive. We all get “stock tip” right? Let’s say you read or hear that this company’s intrinsic value is $100 per share. Then how do you evaluate the quality of this information? One way you can do this in our example, is increase the dividend growth rates. What level of growth would be required for a present value of $100 per share? A present value of $100 per share requires a dividend growth rate of about 21% per year. That is unlikely to happen and we can conclude that estimate is probably too optimistic. Sensitivity analysis like this are useful in determining how the assumptions hold up to the “good thinking” test. They also help develop a possible range of outcomes and for testing divergent points of view. Brookfield Infrastructure’s track record shows a 7% or 9% dividend growth rate is certainly achievable. A 21% is not likely in my view. The ability to estimate intrinsic value provides the reference point we need to make intelligent investment decisions. The Dividend Discount Model’s four essential steps summarizes a tool we can use with dividend companies. It provides a way to free us from dependency on others on where we place our hard-earned money. Broader valuation methods are used on non-dividend stocks. We’ll examine them in the future. Let’s put this first tool to good use until then to improve our investing. The best of investing to you!